A wideband CCTV video-isolating transformer (ground loop transformer) used for the reduction of longitudinal mains induced hum. For high-resolution video signals and 'down the cable' telemetry it is essential that all components in the signal path are of sufficient bandwidth to pass the full frequency range of both signals with minimal distortion. 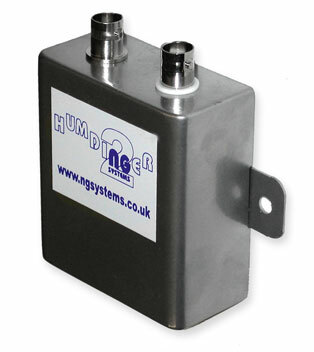 The Humdinger has a bandwidth superior to most of its similarly priced competitors with negligible insertion loss.